Christmas shopping seems to begin earlier and earlier each year. (At least if you are smart it does.) There is nothing worse than fighting the last minute holiday shopping crowd... believe me, I know! The unofficial kick-off to holiday shopping begins this weekend, and it starts with consumers camping out overnight to catch the Black Friday deals. With the insanity that has become Black Friday and the exceptional deals that only big box corporations can offer, American Express decided to reinvent Thanksgiving weekend shopping by creating Small Business Saturday and "Shop Small." Shop Small is a movement to celebrate small businesses every day and to help communities thrive. 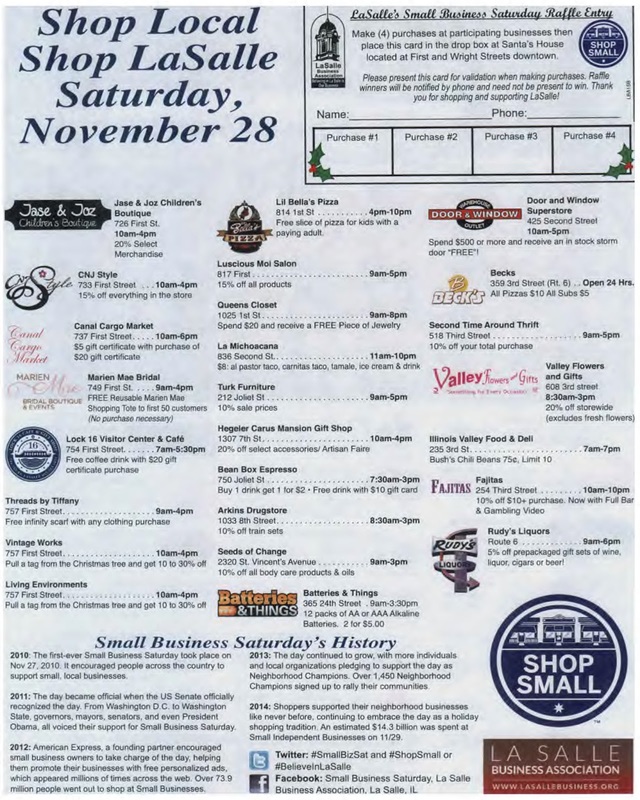 Small Business Saturday is a day dedicated to supporting small businesses across the country. The movement began in 2010 and has since grown to become quite the event. Last year alone, 14.3 billion dollars were spent at small, independent businesses. Our very own downtown LaSalle is taking part in Small Business Saturday. Many downtown businesses are offering discounts (or even free goods!) this Saturday, November 28 when you make a purchase. Come spend some time with us this weekend, support small business and reap the rewards! View the following shopping flyer to see some of our deals. To enhance the experience, the LaSalle Business Association has added a raffle contest to the mix. Make 4 purchases from participating shops, and have each business validate your raffle card (shown on the flyer above). Completed cards will be eligible for the raffle. 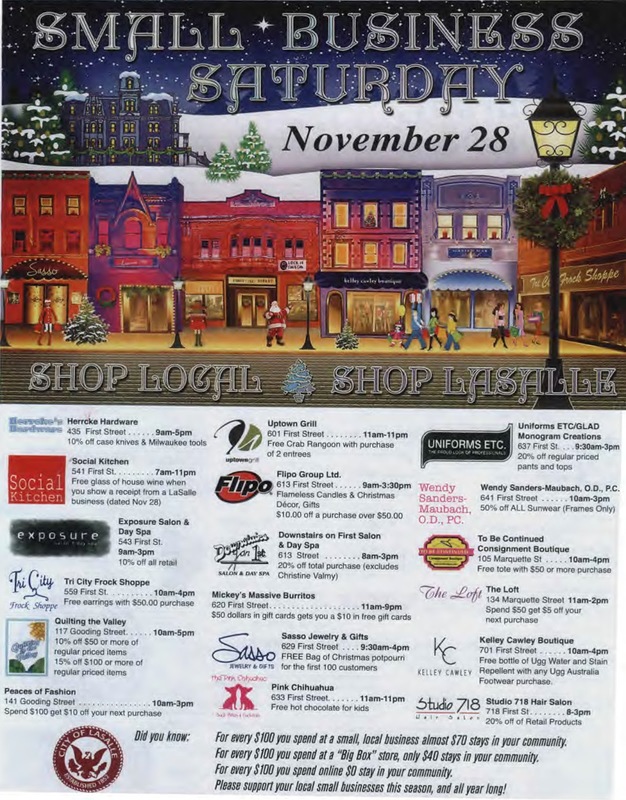 The winner will take home items donated by participating downtown businesses for Small Business Saturday. So stop down this weekend, enjoy the festive holiday atmosphere, receive some great deals, and who knows... maybe even head home a winner! 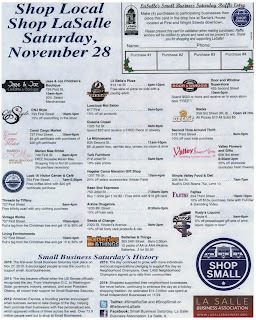 So what exactly does this idea of Small Business Saturday do for us? Most of us can simply use our American Express credit card at participating small businesses and receive some sort of credit on our account. It's quick; it's easy; and we are probably going to spend that money anyway, so why not do it on small business Saturday? Shopping local creates jobs. Shops in our town create local employment and self-employment. These people, in turn, spend in the local economy. Local independent shops invest more in our communities. Local businesses are proportionally more generous in their support of local charities, schools and community events. So supporting local shops means a financial contribution to your community. Local shops sell great products at affordable prices. Some people get out of the habit of shopping locally and are then surprised by the range of products available. Shopping locally saves you time and money. You travel less, saving on time and fuel. Shopping locally retains our communities. People don’t like losing shops and services in small towns but don’t equate this with how they spend their money. Shopping locally retains our distinctiveness. Independent shops create distinctive shopping experiences and stock different products. Local businesses respond more quickly to the needs of local customers, stocking products to meet changing population needs. Shopping locally saves the environment. Local shops often stock a high percentage of locally sourced goods that do not require long-distance transportation, helping to reduce our global footprint. Local shops are for everyone. Most people can get to their local shops easily. This is especially important for the elderly, young people and others who rely on public transportation. Local shops value you more. Evidence from numerous surveys show people receive better customer care and service locally. These businesses survive by their reputation and repeat business, which means you get a higher standard of service. Shopping local saves services. Private and public sector services cluster around shops. As shops disappear, so do hairdressers, banks, restaurants and other businesses.